AWE Society | The mission of the Area Wilds Exploration (AWE) Society is to facilitate radical reconnection with the everyday wilds of which we are a part. Join us on Saturday, June 9 for a walk into a precarious wetland on the brink of development for an intimate engagement with soil and clay. This two-part workshop will include an examination of soil profiles for evidence of hydric characteristics (a prerequisite for the state’s preservation of wetland sites). The soil profiles will yield information that will be used to advocate for the protection of this lush urban wild space. We will also sculpt the clay bodies into aesthetic and utilitarian objects to be fired at a second workshop to be held at TYMPANUM in Warren, MI on June 30, 2018. We will meet at Steinhauser Park and then walk to the site. See ya soon! The landfills became swollen with an unknown substance and the earth continued to rebound from the last ice age, resulting in the surprising emergence of rolling hills covered with weedy turf grass, burdock and Queen Anne’s lace. The roads and parking lots fractured and crumbled like the crust atop a creme brulee. The homogenous strip malls went untended and could be heard screeching and moaning as they collapsed onto the new horizon. Limited Edition Flexi Discs Coming soon! looking for the shelters of non-human residents. Record what you see in words or images. Banjo decided to play too! After much internal debate, I decided not to try and retrieve the DOLLAR that was in the hole! It took a lot of self-control… but I decided that if my arm got bit by some unknown creature… the dollar would really not have been worth it, plus, maybe the beast needs it more than I do. 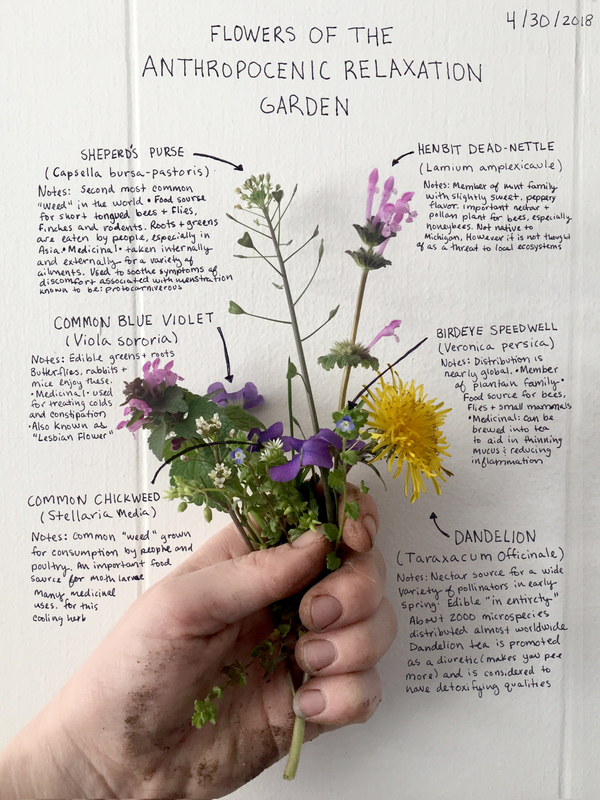 Join local artist & researcher Bridget Quinn for a walk in urban nature! Bring water, a camera or sketchbook and an open mind. Don’t forget to wear comfortable shoes that can get dirty! Meet us on the walking path by the playscape at noon!